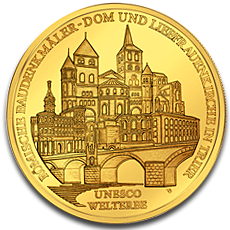 Although the 100 Euro Trier gold coin was minted in 2009 by the German government, Trier which is the oldest city in Germany was included in the UNESCO World Heritage Sites list in 1986. There were only minted a total of 320,000 gold coins, therefore each of the five German mints issued 64,000 gold coins. The 100 Euro Trier gold coin weighs, like all the other coins from this series, 15.55 grams or 1/2 troy ounces of gold. The purity of the gold used in manufacturing these gold coins commemorating Trier, the oldest German city, is of 99.90% or 24 carats. This gold coin also has as a characteristic the diameter of 28 mm. On the obverse of the 100 Euro Trier gold coin are designed one of the oldest Roman buildings in Germany in a majestic ensemble engraved in pure and solid gold. The outstanding monument present on the obverse of this coin is the Cathedral of St Peter and Church of our Lady. And all the monuments are based on a Roman bridge over the Moselle. The inscriptions that surround these impressive engraved buildings are UNESCO WELTERBE, ROMISCHE BAUDENKMALER-DOM UND LIEBFRAUENKIRCHE IN TRIER. The reverse of the 100 Euro Trier gold coin illustrates, like all the German coins, the German Federal eagle which is accompanied by the 12 starts found on the European flag, the minting authority which is the BUNDESREPUBLIK DEUTSCHLAND, the denomination of 100 EURO, and 2009 when the coin was minted. The letter A, found near the inscription of 100 Euro, indicates that this gold coin which is illustrated on our website was minted in Berlin. The 100 Euro Trier gold coin which was minted in 2009, as well as all the gold coins minted in order to commemorate the German cities added on the UNESCO World Heritage Sites list, offer investors an opportunity that should not be missed. This opportunity is simply the idea of detaining pure gold, gold of 24 carats, at an affordable price and under the shape of a coin that attracts all admiration. Gold is never a bad investment and is something that should be bought at the right time and gold coins like the 100 Euro Trier gold coin should be kept until its value increases. Therefore, investors should enjoy the sight of their German gold coin minted in 2009 until the demand for this coin reaches a peak. In that situation, the premium of the coin will increase and the coin can be incredibly profitable. If the gold spot price increases at the same time then it is even better. Collectors are very interested in the 100 Euro Trier gold coin because it is a rare occasion of owning the beautiful buildings found in Trier engraved in gold. Collectors impatiently awaited the release of this gold coin in 2009 which came after the Goslar gold coin minted in 2008. If you are looking to acquire the 100 Euro Trier gold coin search no more because it is available on our website.